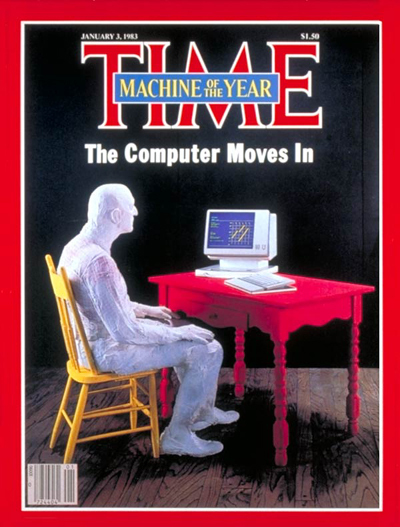 Le magazine TIME change sa traditionnelle nomination de « l’Homme de l’Année », en choisissant de nommer l’ordinateur « Machine de l’Année ». Ever see one of these before, mister ? Yes, you. I’m talking to you, ma’am. Ever work one of these Commodores or Timex Sinclairs or Osborne Is or TRS-80 IIIs ? How do you like them Apples ? Just a joke, son. Good, clean fun. But you look so skeptical, like you’re from Missouri, and I want to sell you one of these beauties, ’cause you need it and ’cause you want it, no matter what you say. Deep in your all-American heart (you are American, aren’t you, pal ? ), you crave this little honey, which will count for you and store for you and talk for you, and one day it might even kiss for you (no offense, miss). Point is, it will save you time. Time time time. And we need all the time we can save. Can’t kill time without injuring eternity. Thoreau said that. Great American, Thoreau. You say : Why should I want to save time ? I hear you, friend. I hear you. You wonder where it gets you, saving all that time, when you think about old Henry Ford’s gizmo that was supposed to save a peck of time. Only instead of conquering the open road, we wound up living on it. You’ve got a point. You a college boy ? But this is the country of the A-bomb and the zipper. We always save time, good and bad. Tempus fugit. Time is money. Most of all, time is dreams. And computers give you time for dreams. This sweetheart here, this little baby, looks like any ordinary machine, isn’t that so ? A mess of screws and buttons, a whole heap of plastic. Comes with new words too : RAMS and ROMS. Think that’s what the machine is made of, do you—the hardware and the software and the mouse ? Not a chance. The computer is made of you, lady. It’s got you all inside it. You wished it here. No, not to do your taxes or to teach you German or to whip you in Pac-Man four out of five. You wished it here because the country was running low on dream time. Which provides equal time. I’m talking social equality. I’m talking freedom with a capital F, like when the railroad first rolled in 150 years ago, roaring and puffing over the countryside, scaring the chickens and the cows, but offering everyone a ride all the same, that’s everyone, I say, giving the Republic to the people. Just like the computer. Now I’ll tell you something about machines in American history. No, don’t walk away ; won’t take half a minute. We may have turned into what looks like a nation of doohickeys, but that isn’t what we had in mind at the start. What our forefathers (bless ’em) wanted was the land, not machines, the great, wide, beautiful land that was thought to go on forever. When the machines came clanging along, they were supposed to let folks enjoy the land more, the green grass and the blue water. Only they got out of hand, you see, until all the lovely forever greens and blues got squeezed in a corner full of national parks and the sky choked black with factories. That isn’t what we intended, though. Machines were meant to open the territory, not close it down. What’s all this got to do with computers ? you ask. I’ll tell you. They reopen the territory, that’s what they do. Oh, not the land, of course. That’s gone like the topsoil, with the wind. But the land was never our real territory anyway. It was the dream, my friends ; the territory was always the New World ideal. We don’t ever want to run out of that, do we ? Goodbye land. Hello space. Can’t you picture all those moons and stars, smiling and winking and waiting for a visit ? Howdy, Mr. Jupiter. Inventions arise when they’re needed. This here screen and keyboard might have come along any old decade, but it happened to pop up when it did, right now, at this point in time, like the politicians call it, because we were getting hungry to be ourselves again. That’s what I think, buddy. « The most idealist nations invent most machines. » D.H. Lawrence said that. Great American, D.H.
O pioneer. Folks over in Europe have spent an awful lot of time, more than 200 years if you’re counting, getting up on their high Lipizzaners and calling us a nation of gears and wheels. But we know better. What do you say ? Are you ready to join your fellow countrymen (4 million Americans can’t be wrong) and take home some bytes of free time, time to sit back after all the word processing and inventorying and dream the dear old dream ? Stand with me here. The sun rises in the West. Play it, Mr. Dvorak. There’s a New World coming again, looming on the desktop. Oh, say, can you see it ? Major credit cards accepted.